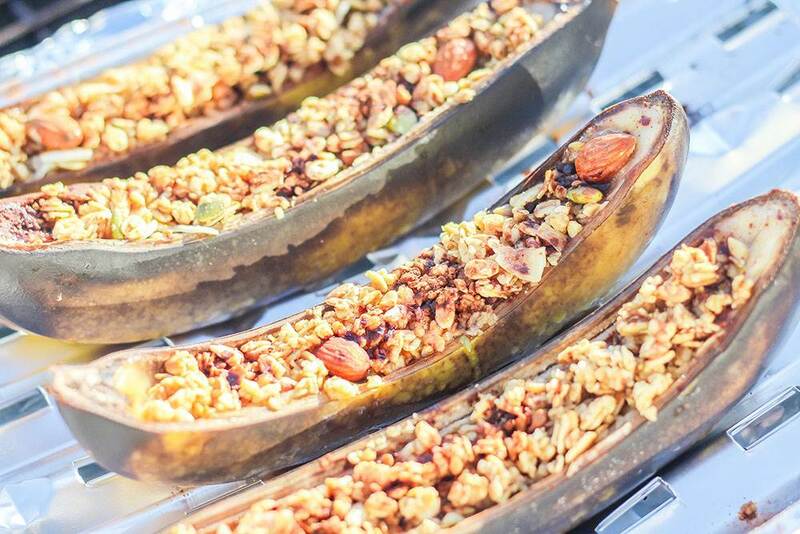 Take your campfire treats to the next level with this delicious Granola and Banana Boat Campfire desserts. There’s something special about cooking on an open flame. Maybe some of your own favorite childhood memories include cooking s’mores during a family camp. It seems to be a time when you relax, and have fun chatting with those around you. 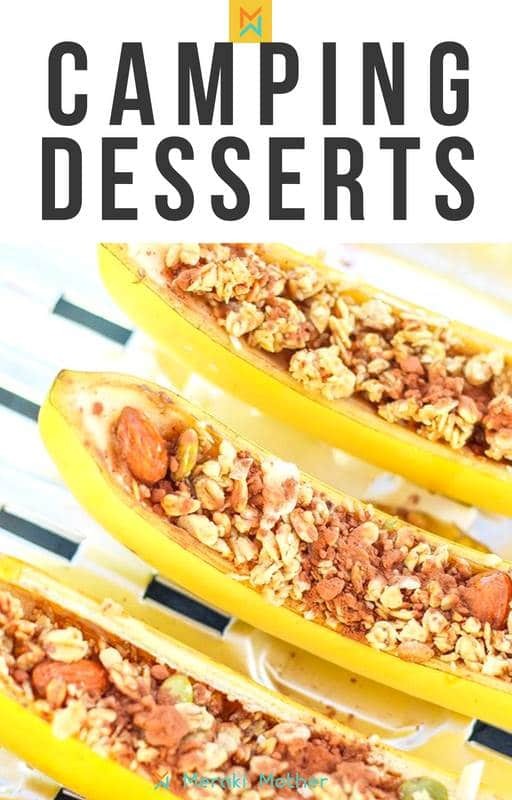 This dessert is going to be a be a huge hit with everyone in the family and a guaranteed to become a firm favorite with the kids. We are sure they will become a fond part of their own childhood memories. 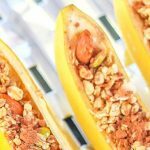 All ingredients for this campfire dessert recipe are conveniently easy to transport on a camping trip or day out. 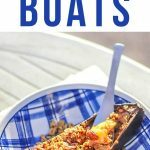 These boats also make a great snack to cook on your fire pit at home. 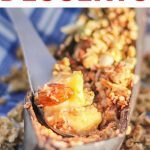 If you want to make a dessert that is full of goodness and healthy products you have to add this nutty homemade granola to your recipe. 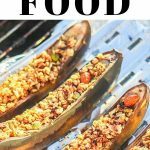 You don;t necessary need to be camping to enjoy this recipe, apart from a campfire you could use either a fire pit or a bbq grill to cook the bananas too. To keep things easy and organized I used an disposable aluminium tray for easy placement of the bananas above the fire. 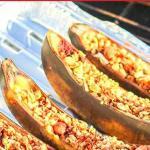 If you are using a weber bbq grill,you can close the lid and the bananas will cook on a low heat for about 15 minutes. 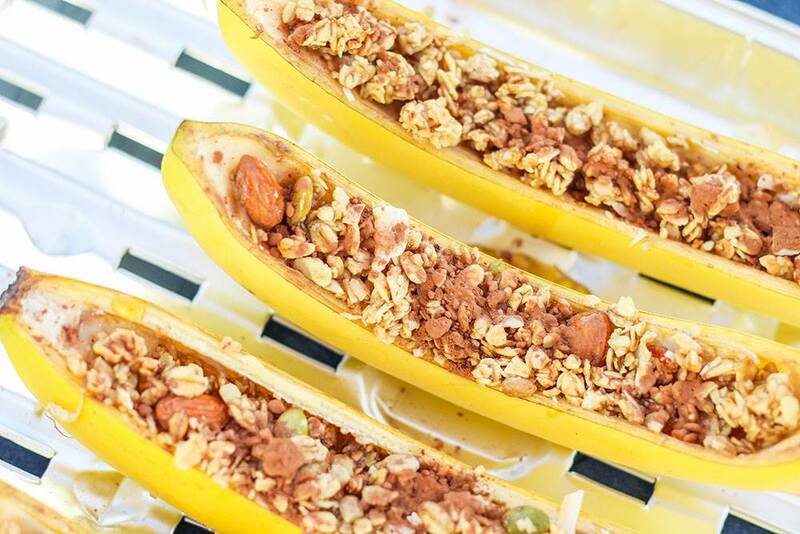 These Banana Boats make the perfect campfire dessert. Also a great BBQ dessert to share with friends. To prepare the bananas first slice the length of each banana curve with a knife. 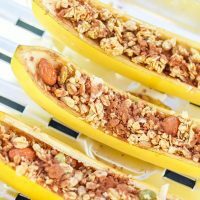 You should be basically cutting off the skin and not so much the fruit inside. Scoop a little bit of the banana with a spoon. We are not going to use the scooped banana for this recipe so you can eat it. 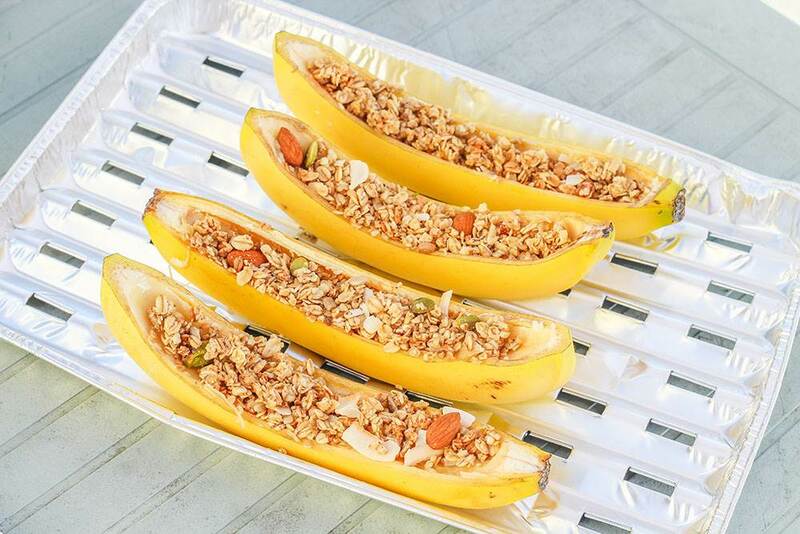 Place your bananas on a aluminium disposable bbq tray with the cut laying upright resembling a boat. 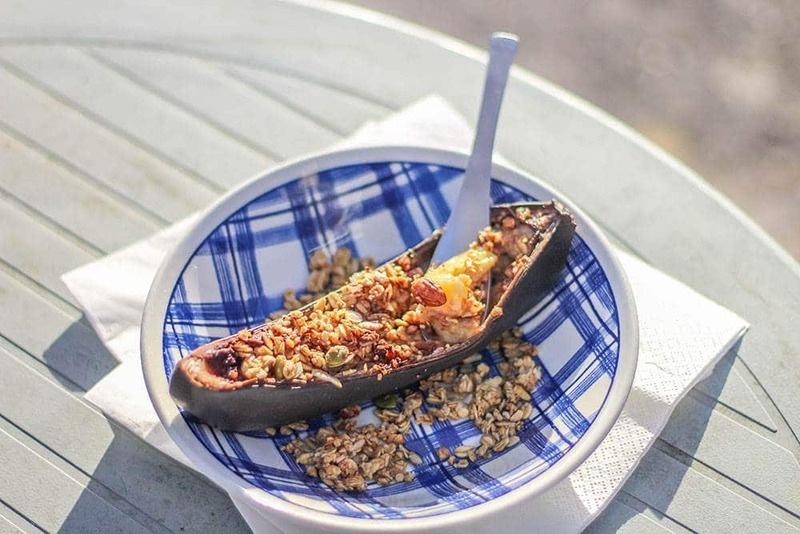 Fill the middle of the banana with your handmade or shop bought granola. Sprinkle the unsweetened cocoa powder on top and drizzle the whole mixture with one spoon of maple syrup for each banana. Wrap the entire aluminium tray in foil to seal the dish and bring it to your campfire. Set it above the fire on a rack or on the side around and close the fire, not directly on the fire. 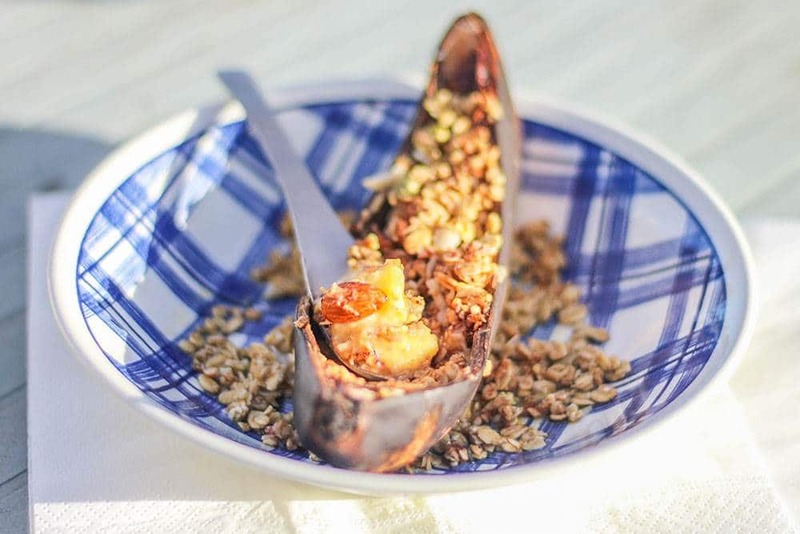 The bananas will cook slowly for 15 minutes or until the banana is soft and cooked. Their skins will turn dark. Check your bananas frequently because depending on the how strong your fire is they might take less time to be ready. 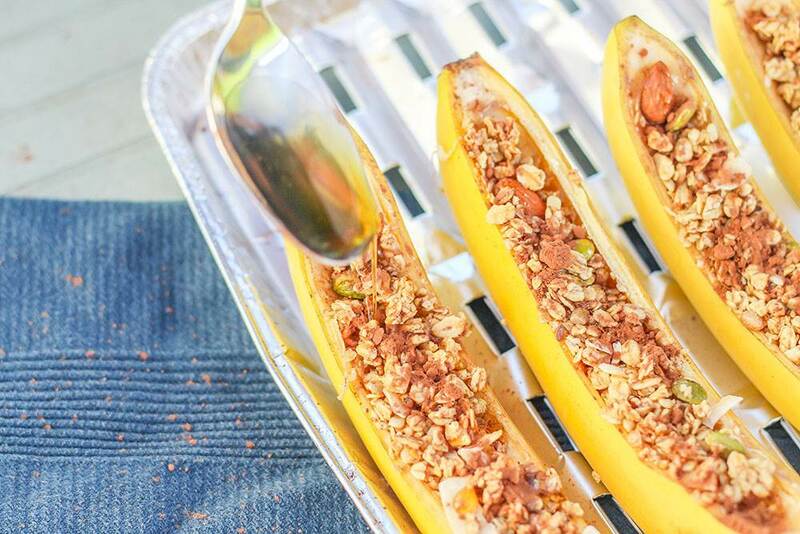 Once ready, take the aluminium tray out of the rack and serve the bananas immediately.